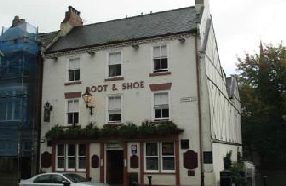 Conveniently located on a corner of Darlington’s well-kept, cobbled marketplace, the newly refurbished ‘Boot and Shoe’ is the ideal base for both business travellers and visitors touring County Durham, Land of the Prince Bishops. Centrally heated and with every facility close at hand, most rooms feature a generously-sized, fully fitted en-suite shower room and all are equipped with colour TV and tea/coffee making facilities. Accommodation on The Boot and Shoe’s top floor comprises one double and one twin room with a shared bathroom, making it ideal for added privacy or families with children.